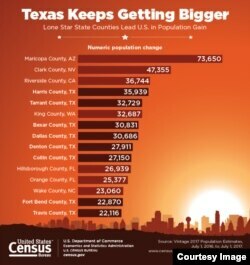 Texas continues to be America’s fastest-growing state, the U.S. government Census Bureau says. Six of the nation’s top 10 largest-gaining counties between July 1, 2016 and July 1, 2017, were in Texas, the bureau recently said in a news release. The fastest-growing area in the country was the Dallas-Fort Worth-Arlington metropolitan area which includes 13 counties in Texas. It gained 146,000 residents last year. Molly Cromwell is a demographer at the Census Bureau. She said the Dallas area “attracts large numbers from both international and domestic migration.” In other words, the area draws people moving within the United States and those moving to the United States from other countries. Many large metro areas in the country, Cromwell explained, depend mostly on “international migration and natural population increase for growth. Lloyd Potter is Texas state demographer at the University of Texas San Antonio. He said in a statement that people most likely relocate to Texas for its “resilient economy” and cheaper housing costs. Potter added that oil and gas production continue to be a major part of the state’s economy, but other sectors, such as information technology, manufacturing and biomedicine are important sources of job growth. In addition to good jobs and cheap housing, Texas is one of the seven states with no state income tax. Demographers expect Texas to continue to grow, though its rate of growth may slow down. While domestic migration is a major reason for Texas’s growth, recent international immigration is also up. And people are coming to the state from “a greater variety of nations than in the past,” Potter added. Texas state demographers have observed an increase in immigrants from Asian countries and a decrease from Latin American countries -- especially Mexico. VOA’s Matt Hilburn reported on this story. Xiaotong Zhou adapted it for Learning English. Ashley Thompson was the editor.